The electrostatic stress in a cable isn’t uniformly distributed. The potential gradient is inversely proportional to the distance from the center of the cable. Hence it will be maximum (gmax) at the surface of the conductor and goes on decreasing until it becomes minimum (gmin) at the surface of the sheath. That means electrostatic stress in the dielectric of a cable is maximum at the surface of the conductor and minimum at the surface of the sheath. Obviously, for a safe cable, the dielectric strength of the insulation provided must be more than gmax i.e. maximum value of potential gradient. As the electrostatic stress in a cable isn’t uniformly distributed, the strength of the dielectric required isn’t uniform either. We need maximum dielectric strength only at the surface of the core. The remaining dielectric is unnecessarily strong and hence not utilized properly. This also causes the cable to be unnecessarily thick. A large size of electric equipment is always a disadvantage. Furthermore, the possibility of insulation breakdown is more if the stress distribution is non-uniform. These problems are rectified by Grading of the cables. Grading of a cable is nothing but the process of achieving uniform electrostatic stress in the dielectric of cable. This is achieved by making potential gradient equal throughout the dielectric layer. It can be done in two ways - (i) capacitance grading and (ii) intersheath grading. Let an underground cable consist of three dielectric layers as shown in the above image. 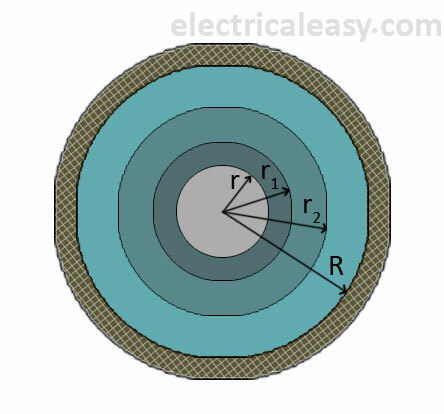 The inner conductor core is represented by the circle of radius r. The radii of the three dielectric layers are r1, r2 and R respectively. Similarly, let relative permittivities be ε1, ε2 and ε3 respectively. The relative permittivity values and their distances are ε1 > ε2 > ε3 and r1 < r2 < R. The uniform dielectric stress can be achieved by maintaining the product of permittivity and radius of each dielectric as same, i.e. ε1r1 = ε2r2 = ε3R. Ideally, the dielectric stress will be uniform throughout the cable if we use infinite layers of dielectric. Practically, two or three layers are used. The chief disadvantage is that we require more number of dielectrics with their permittivities varying over a wide range. These are, of course, costly. An alternative is Inter sheath grading. In this method, instead of using various dielectrics and having a composite dielectric, we use a homogeneous dielectric material. 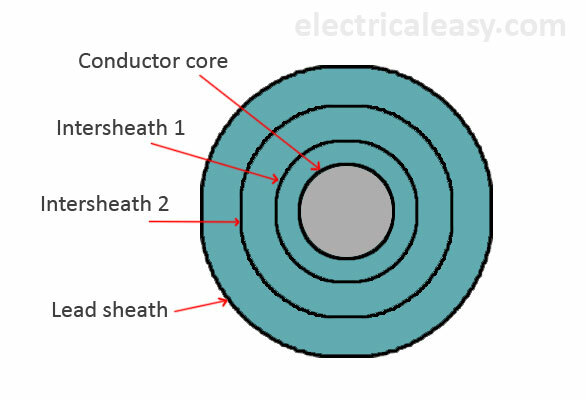 However, in order to distribute the stress properly, we use extra metallic sheaths between the conductor and the main sheath. These intermediate sheaths are called ‘intersheaths’. These intersheaths are then held at adequate voltage levels. This method improves voltage distribution in the dielectric of the cable and consequently uniform potential gradient is obtained. There are certain disadvantages of intersheath grading. The major limitations arise in fixing the intersheath potentials accurately and the losses encountered due to the increased charging currents of the various inter sheaths. For these reasons, this practice is rarely employed.